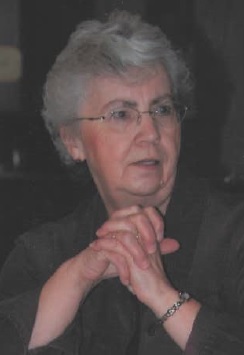 Passed away peacefully surrounded by her loving family at Leacock Care Centre, Orillia on Monday April 15, 2019 at the age of 76. Irene, beloved wife of Harold Peckham for over 55 years. Loving mother of Heather Beatty (Mike), Pam Hill (Larry) and Melissa Crerar. Cherished grandmother of Ryan, Kendyl, Sam and Joe. Dear step-grandmother of Matthew. Loved sister of Earl Grigg (Lori) and the late Margaret Nixon, Charles Grigg (Mary) and Evelyn Wallis. Survived by brother in law Charles Wallis. Fondly remembered by her honouary daughters Donna De Santos, Julie Mori and many nieces & nephews. The family wishes to thank Dr. Ho, Dr. Gardhouse and the amazing staff of Leacock Care Centre for all of their care. Following cremation, visitation will be held at the Mundell Funeral Home, 79 West St. N., Orillia on Monday April 22, 2019 from 1 pm until time of Celebration of Life at 2 pm. If desired, Memorial Donations to the Alzheimer Society, Multiple Sclerosis Society or the Canadian Cancer Foundation would be appreciated by the family. Messages of condolence are welcomed at www.mundellfuneralhome.com.